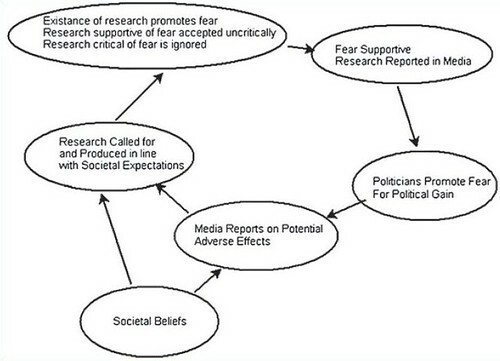 Many folks are discussing Christopher Ferguson’s latest paper on “The School Shooting / Violent Video Game Link: Causal Relationship or Moral Panic?” And with good reason. It’s an important look at how “moral panics” develop in modern society, in this case around video games. [Moral panics is a subject I have written on at length here many times before. Alice Marwick’s brilliant article on “technopanics” is also worth reading in this regard]. As I’ve noted here before, Ferguson has penned many important articles raising questions about the claims made by some other psychologists (and politicians) that there is causal relationship between exposure to violent video games and youth aggression. Ferguson has shown there are reasons to be skeptical of such claims — both methodologically and practically-speaking. More on that down below. Importantly, Ferguson also notes that the generation gap fuels the fires of moral panics: “[T]he majority of individuals critical of video games are above the age of 35 (many are elderly) and oftentimes admit to not having directly experienced the games. Some commentators make claims betraying their unfamiliarity,” he says. 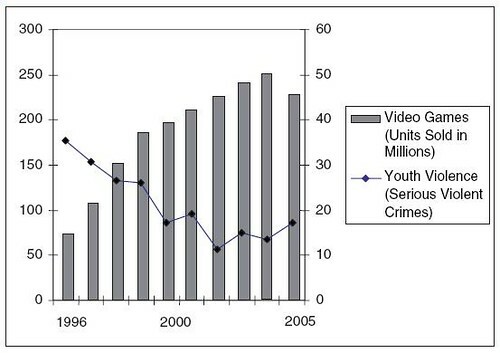 as violent video games have become more prevalent, violent crimes have decreased dramatically. This is true both for police arrest data, as well as crime victimization data. Similar statistics for reduced crime have been found in Canada, Australia, the European Union, and the United Kingdom using both arrest and victimization data. This is certainly not to say that violent video games are necessarily responsible for this decline, even partially. However, this certainly cuts away the basis of any belief that violent games are promoting societal violence. The correlation (an astonishing r = -0.95) is simply in the wrong direction. This would be akin to lung cancer decreasing radically after smoking cigarettes was introduced into a population, which is simply not the case. I highly recommend Prof. Ferguson’s latest paper and hope that it can contribute to the shaping of a new dialogue about youth and media. We do need to be good stewards of our children and be mindful of watch they watch, listen to, download, and play. [I’ve written an entire book about how to do so.] But we first need to bring this moral panic over games to an end so we can get on with a serious, level-headed conversation about how to better mentor our kids in an age of media abundance. The current hysteria is not helpful.